As I point out in Hoosier School Heist, if it wasn’t for the Bush family, Charter Schools USA (CS USA) would never have been imported from Florida into Indiana. As my book details, CS USA has been buying Indiana politicians for some time. And now, they are at it again, out to ask the state board of education for more expansion, which is why people need to see that the battle between Pence, Republicans, and fake Democrats against Ritz over control of the state board is a battle between pro-school privatizing millionaires and everyone else. In other words, CS USA wants to continue to make money from the school, as opposed to giving it back fully to IPS, while IPS recruits the students for the charter school company and takes the heat for bad test scores. Jeb Bush’s buddy (and Bush family friend) Jon Hage owns Charter Schools USA, which now operates Emma Donnan Middle School, Emmerich Manual High School, and the Thomas Carr Howe Community High School in Indianapolis. From the looks of recent campaign finance records, Hage and crew want to really expand operations in the Hoosier state. 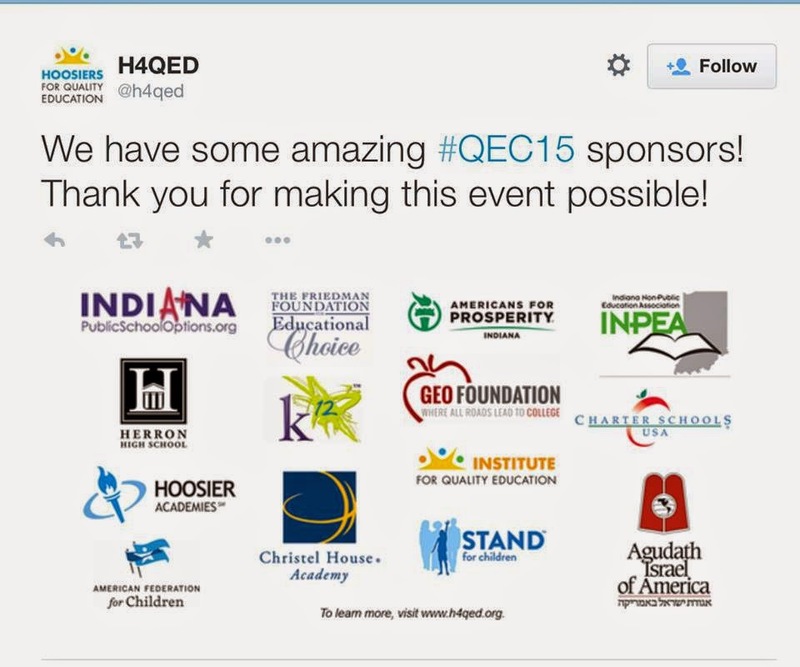 In 2014, CS USA joined the Amway/Walmart/Hedge Fund PAC (now called Hoosiers for Quality Education, or H4QED, a billionaire front group holding a rally today in Indy) in Indiana, handing the PAC $5,000. That same year, CS USA also gave House Education Committee chairperson Bob Behning, who now desires to be an education reform lobbyist, $2,000. Since 2012, CS USA has given $23,000 to politicians and PACS in Indiana, alone. But it doesn’t end there. Red Apple Development, the real estate branch of CS USA, has also given big money: $17,000 since 2012. This year they contributed $5,000 to the Hoosiers for Quality Education PAC, which funds David Long, Brian Bosma, and a whole slew of Republicans now attacking Glenda Ritz and teachers. In total, Jeb Bush friend Jon Hage’s CS USA and Red Development have dropped $40,000 into Indiana campaign funds since 2012. The school privatizing state board will do what the charter school companies want, plain and simple. Recently, as Chalkbeat Indiana reported, state board member Dan Elsener (who is a major player in my book Hoosier School Heist) said. “We didn’t say we’re no longer intervening at Arlington and we’re giving it back to IPS. We were careful there. We took responsibility. If we just say, ‘It’s over now, everything’s fine,’ I’m not too sure that’s realistic. Since House Bill 1638 is now in the works for the state to take over even more Indiana schools, Ritz is an obstacle to the billionaires and millionaires. This, my friends, is why Republicans and Wall Street Democrats like Gordon Hendry want Glenda Ritz out of the way. More people need to understand this and say it loud and clear. Thank you Doug Martin for all the research you have done. I hope to be a factor in letting the public know how we are being duped. They are relying on the stupidity of the Hoosier voters! They are relying on the stupidity of the Hoosier voters.